The inspiration for the Level One Certification comes from our love for the mace and recognizing the need to build a structural and sound platform to educate, strengthen and empower those who flow so that they receive the education and support they deserve on top of instilling the basic movement patterns and conditioning it takes in order to advance to Level Two certification. 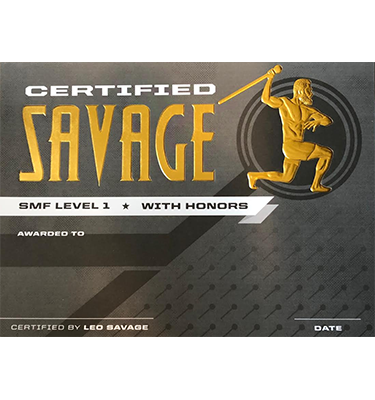 The SMF™️ team does not take credit for inventing any of the structures, movements or the concept of Flow State in this Level 1 Certification. The use of these movements and the mace itself have been utilized in many different practices for many years. While there are visual similarities, the specific SMF™️ elements and the way we apply and teach are different. The creation of this certification comes from the combination of Leo’s background in martial arts and his education in the fitness industry. Inspire. Educate. Put Mace in Hands.